Be True is a multi-faceted messaging campaign to change (correct) student perception of substance use at our school. Generally, teens overestimate the percentage of their peers who are using. This misperception makes it feel like more of their peers are engaging in unhealthy behaviors makes it feel like the norm. We use Healthy Youth Survey data to correct the misperception and to solidify the true norm! 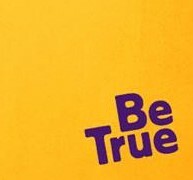 The Be True tagline was developed by students at Issaquah High School. The students want to encourage more people to Be True to themselves, to their sports, to their talents by making the choice not to use. Look for the Be True campaign throughout the school year in posters around the school, on the reader board, on iVision, through giveaways and more! How did Be True come about at IHS? Influence the Choice - Drug Prevention Alliance for Youth is a coalition aimed at the prevention and reduction of youth substance abuse within the Issaquah School District service area. The Coalition accomplishes this mission through community resource networking and strategic action planning aimed at changing community norms. Influence the Choice (ITC) is proud to be partnering with Issaquah High School and the PTSA to bring you the third year of the Be True campaign. If you have any questions about the Be True campaign or want to attend an ITC event or meeting please contact IHPTSAPrograms@gmail.com.